By: M. A. (Don) Biadog, Jr.
Eighty-four Camps Courtney, Foster, and Kinser Young Marines (YM), YM staff, and parents enjoyed a fun-filled day of training at Jungle Warfare Training Center (JWTC), Camp Gonsalves, Okinawa. The pre-dawn departure and two and a half-hour ride to the Marine Corps’ premier JWTC, seemed like a “short distance” for the extremely excited and enthusiastic young participants. According to Mr. Leon Hill, Okinawa Young Marines Battalion Commanding Officer, “This is the first time that the Okinawa Young Marine Battalion is able to come out to JWTC.” Okinawa Young Marines unit, established in 1995, is the only battalion operating outside the continental United States. When we arrived on Camp Gonsalves, the JWTC staff welcomed us with open arms. Training started right away as soon as we hit the deck. Led by the professional JWTC staff, the Young Marines hiked for a mile and a half to the Rappel Training area. Along the way, we passed by the bivouac sites of deployed Marines from California. The curious young children were fascinated of the flora especially the giant palm fern, the biggest fern in the world. Also, everyone had a chance to glance at the jungle open wall classroom number three, a contrast to their school’s classroom. Hearing the motivated Young Marines’ cadence during the round trip hike brought smiles to the JWTC staff. Twenty minutes later we finally arrived to our destination and no one dropped out. Training started immediately as soon as we reached our ultimate destination, the Rappel Training site also known as the “Cliff”. The area has a colossal “cathedral” which provided a shade and protected the trainees. Standing on top of the table, SGT Robert Curtis, JWTC staff, welcomed everyone and started teaching the basic knots used in rappelling. It was quite an awesome sight to behold the young ones as they attempted to follow the hand movements of the instructor. It was a challenge indeed for all the Young Marines who tried to maneuver the kermantle “green” rappel rope with their short and small fingers. The joint staff members of Young Marine and JWTC were on hand to assist the children. 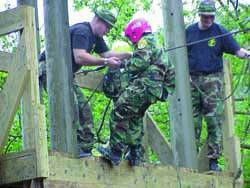 Every time there is a Young Marine unit training evolution, safety is emphasized. So during the training at JWTC this last Saturday 11 March 00, safety was the top priority. The sixty-five children were guarded and watched by nineteen YM staff and over a dozen JWTC service members. We also had duty corpsmen during the entire training period. Everyone came out of the jungle okay. Since I serve as volunteer Chaplain, it was logical for members of the staff to request prayer for a “good weather” and safety during training for all hands. Although it rained part of the time, I still believe that the good Lord answered our prayers. Everyone had a blast and enjoyed the training. In my previous visit with the gung ho JWTC staff I was informed that the rain would not bother them and that they were not training if it’s not raining. The once-in-a-lifetime one-day training at JWTC of Young Marines provided an inspiration to the trainees and the trainers. CPL Mark Villanueva (Camp Kinser YM) commented, “Before I started to rappel down I was scared but during the rappelling itself was it was not scary after all.” LCPL Brandi Perry (Camp Foster YM) said, “The “chow time” was fun.” Major Charles Girard, FSO, facilitated in the procurement of box lunches and MRE. Gunnery Sargent Richard Smith, JWTC Chief Instructor, expressed his gratitude this way, “ Thank you for coming out and allowing us to help you. We enjoyed your visit here today.” Hm3 Ryan Dilks, JWTC Corpman, said that this type of training would “motivate people to join the military and inspire leadership and responsibility.” “I love to go back there (JWTC) again,” said CPL Daniel Biadog (Camp Courtney YM). It was a hectic schedule, but full of edutainment type training and fun-filled day for all hands.